The Vehicle History API enables access to the raw vehicle history data behind the VinAudit Vehicle History Report, either for your internal use or for reselling vehicle history to your customers. It requires an API bulk access account. Once you have an API-enabled account, you can login to access your API key. From there, your application can access data by making a HTTP requests to our API server (api.vinaudit.com). 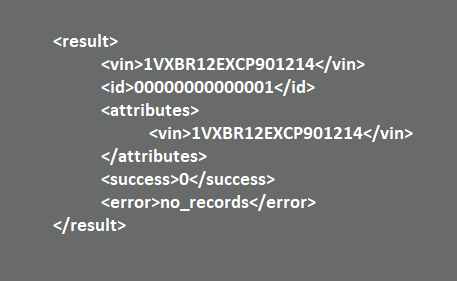 The output can be either in JSON or XML. Full documentation below. recordType: The type of record. List of values: ‘Junk and Salvage’, ‘Insurers’. vehicleDisposition: The vehicle’s reported disposition. intendedForExport: Whether the vehicle is intended for export. date: The date of the event. date: The date of the record. sourceName: The name of the reporting entity (ex: National Insurance Crime Bureau). sourcePhone: The phone number of the reporting entity (ex: 800-447-6282). sourceWebsite: The website of the reporting entity (ex: www.nicb.org). sourceCity: The city of the reporting entity (ex: Des Plaines). sourceState: The state code of the reporting entity (ex: IL). sourceZip: The 5-digit zip code of the reporting entity (ex: 60018). type: The type of record (must be “accident”). reportId: The unique report identification number (if available). vehicleYear: The year the vehicle was manufactured (if available). vehicleMake: The manufacturer of the vehicle (if available). vehicleModel: The model of the vehicle (if available). vehicleStyle: The style of the vehicle (if available). vehicleColor: The color of the vehicle (if available). vehicleType: The body style of the vehicle (if available). licenseState: The state the vehicle was registered in at time of accident (if available). damageSeverity: The extent of the vehicle’s damage (if available). estimatedDamage: The financial estimate of the vehicle’s damage (if available). estimatedSpeed: The estimated speed at which the vehicle impact occured (if available). crashSeverity: The severity of the accident as reported by source (if available). postedSpeed: The posted speed limit where the accident occured (if available). mannerOfCollision: The manner of vehicle collision (ex. front to rear). impactArea: The area of the vehicle where the impact occurred (if available). insuranceCompany: The insurance company associated with the vehicle at the time of accident (if available). reportingAgency: The agency that reported the accident (if available). crashLocation: The location of the accident (if available). airbagsDeployed: Airbag deployment indicator (if available). objectStruck: The type of object which the vehicle had struck (if available). sourceName: The name of the reporting entity (ex. Arizona Dept of Public Safety). sourcePhone: The phone number of the reporting entity (ex. 602-223-2000). sourceWebsite: The website of the reporting entity (ex. www.azdps.gov). sourceCity: The city of the reporting entity (ex. Phoenix). sourceState: The state code of the reporting entity (ex. AZ). sourceZip: The 5-digit zip code of the reporting entity (ex. 85009). source: VinAudit internal source name (ex. az_crash). type: The type of record (ex. salvage). listingId: The unique listing identification number for the salvage auction (if available). location: The location of the vehicle (if available). primaryDamage: Description of primary damage associated with vehicle (ex. rear end). secondaryDamage: Description of secondary damage associated with vehicle (if available). odometer: The listed odometer reading, as reported by source (if available). estimatedDamage: The estimated financial damage of the vehicle (if available). exteriorColor: The exterior color of the vehicle (if available). type: The type of record (must be “sale”). listingPrice: The listed price of the vehicle (if available). vehicleMileage: The listed mileage of the vehicle (if available). vehicleYear: The listed year that the vehicle was manufactured (if available). vehicleColor: The listed exterior color of the vehicle (if available). sellerType: The type of seller that has listed the vehicle for sale (ex: dealer). sellerName: The name of the seller that has listed the vehicle for sale (if available). sellerState: The state of the seller that has listed the vehicle for sale (if available). sellerZip: The zip code of the seller that has listed the vehicle for sale (if available). date: The title brand date. This request can be re-issued repeatedly using the same ID and VIN. Your API account is billed at most once for each unique report ID. Once generated, re-issuing the request will return the cached report data. An Extended API is also available for finer-grained control. The API may return “fail_nmvtis” during the follow scheduled maintenance times for the NMVTIS database: 1am-2am ET daily and 2am-5am ET Sundays.